Doctor Who’s Kerblam, or it’s title for writers: how to do contemporary issues in an SF setting, while throwing off your audience before they reach obvious conclusions. Others have written fairly comprehensively on how the plot reflects contemporary labour and employment practices and noted the call backs to earlier iterations of The Doctor, of course with the Fez but also with the mention of Agatha Christie. This episode then uses the typically Who idea of making a simple thing – this time bubble wrap – ominous and then deadly. See previous episodes for shadows, medical staff, robots, toy cupboards, Christmas trees, shop mannequins, musical instruments, made menacing. Bubble wrap’s also a call back to Classic Who, where it was liberally deployed as the monster effect beyond compare. 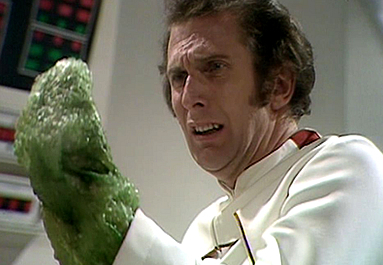 Classic Who: arghhh – green-washing the bubble wrap of doom. I can barely believe either dude. On social media I saw a suggestion that this could’ve been a Christmas episode. With a little tweaking it would’ve worked. Add snow, more festive packaging with the boxes, as there was already talk about gifts, and one big delivery scheduled all at once. It would’ve been a bitter-sweet episode, and the worker could’ve received her first ever Space version of a Christmas present as she elects to work over the holidays because she has no family. But it wasn’t and she didn’t. Never mind. I’m going to skip over issues others have pointed out regarding the characters and plot to remark on other things. Firstly, there was an interior TARDIS scene, and I noted it because I’ve felt starved a bit of the TARDIS in a way I didn’t notice with Russell T Davies and Steven Moffat. It wasn’t merely the door to adventure or a background for introductions, but often the locus of contention as in Amy`s Choice and The Doctor`s Wife. Speaking of this era, the TARDIS is the co-creator of the entire Amy-Amelia-Rory-River saga. If the TARDIS had not delayed in returning to Amelia, she would not have become Amy, would not have spent her wedding night with Rory on the TARDIS, would not have conceived River while time travelling and her daughter therefore would not have had Time Lord characteristics, nor The Doctor’s crib. The Fez reminded me, not only of an earlier version of The Doctor, but also how in ordering items and getting them delivered to future or past selves care of the TARDIS that the TARDIS is home without a big speech about it. It was an action demonstrating a fact. This is in contrast to Ryan who occasionally mentions dispraxia and reticence with ladders but so far there has been little demonstration of how his life differs to that of anyone else aboard the TARDIS. Thus, it’s ok to be told a thing. The TARDIS is The Doctor’s home. But it’s better to have this demonstrated: The Doctor receives mail via the TARDIS. It’s ok to be SF, but it’s worth it sometimes to have familiar notions that enable audiences to relate to characters. It was also nice to see The Doctor use the psychic paper and be more imperious with potential enemies. Except these humans weren’t so much diabolical as so lax and inefficient that they couldn’t see how employees had disappeared. And when they could, they didn’t communicate. And then they cheerily keep going, as if exploiting employment conditions that radicalise workers to the point of terrorism isn’t an issue that can’t be solved with a two-week holiday and more human staff. There, I’ve done it, commented on stuff covered by others. Then Yaz and Ryan saw a woman explode and nothing….. The only tears are, later, for an under-utilised Lee Mack as worker Dan when Yaz remembers he died too. Ark in Space-Best use of Bubble wrap ever!